It’s not only been awhile since I’ve blogged, but it’s been awhile since I’ve blogged about a personal finance topic. However, I’ve gotten a few questions on saving vs. investing and what to do for each and thus, I thought I’d whip up a quick blog post to give you my 2 cents! 1) If you company has a 401k or 403b with a match TAKE ADVANTAGE OF THE FREE MONEY! Put in as much as you need to in order to get the match. Free money is free money and it would be just stupid to not take advantage. If you feel like you can’t afford to have anything more taken out of your paycheck, seriously go through your expenses and see if there are some things you can move around/edit out in order to make it possible. If you need help setting up a budget, see this post HERE. It’s not to be used for a trip you want to take or the newest gadget you want to buy. What it is for is medical bills that pop up or to bridge a gap if you or your partner are in between jobs or something else UNEXPECTED. Why is it important to start an emergency fund before paying off debt or investing? Again these are just my recommendations. Everyone has a different viewpoint on saving/investing priorities but mine are a) start with your company match and then b) build up your savings account. Do you take advantage of your company’s match? Do you have an emergency savings account? I hope this post inspires you to take action on both if not! Happy 2019! If you’re anything like me, you love the energy and promise a new year brings. I totally geek out creating my vision boards (I have one on Pinterest and one hanging on the inside of my bathroom closet! ), goal planning and dreaming about the future. What about you? Do you have some of your own new year goals/resolutions? Although I totally love doing these types of things, I also am fully aware that most new years resolutions don’t last. Most people don’t stick to whatever it is they are trying to change (a big reason I actually like changing small habits vs. creating big goals but more on that another time) past a few weeks or months into the year. This is especially true for health and wealth goals. The reason these goals won’t come true is because while we take physical action (creating budgets/spending plans, going on diets, creating exercise routines, joining a gym etc.) we DON'T ADDRESS THE UNDERLYING REASON WHY WE ARE UNSATISFIED IN THESE AREAS IN THE FIRST PLACE. If we continue to try to create physical change without addressing how we got to that place to begin with (whether that’s being out of shape, overweight, in debt, or something else) OR why we do what we do (like eating a pint of ice cream when we are sad or splurging on some new shoes when we are having a bad week) then the change won't last. We might make it awhile and see changes with our new habits/routines, but eventually WE WILL SELF-SABOTAGE. We will go back to over-eating and over-spending because we are wired to do so. Because we didn't address the underlying causes of these thoughts/behaviors. So how do we actually go about making sustainable change in these areas? Stay tuned for the next post where I will outline a few steps to get you started! Oh hey there! Happy Thursday :) Hope you are having a fabulous week! Now that you’ve got your goals outlined, what are your priorities? Is it travel? Family? Home? Coffee? Food? Music? Again WRITE DOWN 3-5 of your priorities. This will help when you start analyzing your spending and determining if it is in alignment with these priorities. Net income is everything you make after all taxes and deductions are taken out. If you are a W2 employee then this will be your take home pay. If you are self-employed it will be what is left over after you’ve accounted for all taxes etc. Start a list (or even better, put it into a spreadsheet!) of all your fixed expenses. These are all the things you pay that stay the same each month (or relatively so!). A lot of times these are things that you auto-pay such as mortgage/rent, utilities, car payments, insurance (including auto, home and life), subscription services, loan payments, and cable/internet. Once you have all of these down, total them up and subtract from your MONTHLY net income. Once you’ve subtracted out your fixed expenses from your net income, the remaining amount is what you have left to spend on discretionary or variable expenses. These are expenses that fluctuate from month to month such as groceries, dining out, entertainment, shopping, etc. Make a row for each and determine what your target amount for each is. When you add up each of these categories, you should not have exceeded the amount you had left over after you subtracted out fixed expenses. These targets can and will change. I don’t know ANYONE who sticks to their budget 100% and thus it’s important to keep an open-mind when creating these targets. If you haven’t already, pay as many of your fixed expenses on auto-payment. This will save you time and energy from having to write out or log in and pay bills each month. It also will prevent you from missing any payments! After a month or so worth of using your new budgeting system, take a look at your spending and determine if it’s aligned with your goals and priorities. If you say you want to pay down debt but are eating out for lunch every day, is debt payoff really a priority? See if what you’re spending your money on matches up with your goals and priorities, and re-evaluate how you want to spend your money moving forward. This can apply to both fixed and variable spending. Alright - those are the 9 easy steps to setting up a budget! What did you think? Was this helpful? Please let me know in the comments if so. One last note: Budgeting is like dieting. If you go all-in and deprive yourself of anything enjoyable, you will overeat (or overspend!). The best way to go about both of these is making small incremental changes that will add up to a lot of progress over time. 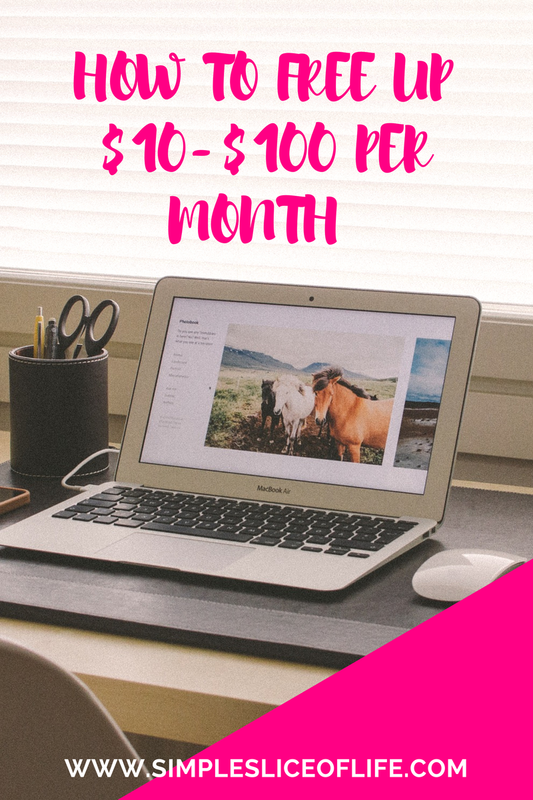 If you have any questions about setting up your own budget or know you need help, email me at info@katieoelker.com. While I'm not condoning opening up lines of credit that are used irresponsibly, a good credit score can be an incredibly powerful thing. Regardless of what you’ve heard, establishing credit and USING IT RESPONSIBLY is not a bad thing (key word: responsibly). Having a positive credit score can open the door to tons of opportunities including buying a car, home, and even starting a business. Below I outline the 6 steps to increasing your credit score. But not just any credit card offer you get (believe me, there are lots of bad ones out there!) I recommend comparing credit cards online and looking for ones with zero annual fees and a lower APR (annual percentage rate). Bankrate is a great site for comparing cards. In addition, it may be easiest to obtain a credit card through the bank or credit union that you use for your banking needs. The first line of credit I obtained was through my bank and I was given a reasonably low rate for a first-time credit card user. Note of caution: It can be very easy to obtain a retailer credit card (TJ Maxx, Victoria Secret, etc.) but they oftentimes have extremely high APRs. Why is this important? Because although I encourage everyone to pay off their credit cards in full, I know that doesn’t always happen and having a lower APR will help you be able to pay less in interest along the way. This is a no-brainer however it can be super easy to miss a payment if you don’t have a system in place to keep track of what is due when. Why is this important? Missing payments not only causes you to have to pay a late fee, it can also increase your APR and trigger an increase in APRs on other cards (even if you’ve never missed a payment!) In addition, even one late fee can significantly decrease your credit score. I strongly encourage you to setup an automatic payment to cover at least the minimum payment in order to prevent this from happening. This is the amount of credit that has been extended to you. For example, if you already own a card that has a $1,000 credit limit, give the company a call and see if they will raise your credit limit (and tell them your reasoning is that you’ve faithfully paid off your balance and will be making some larger purchases in the future - even if you don’t plan to!) Why is this important? Because a large part of your credit score is based on the amount of debt you owe vs. the amount that you have left available. The lower your usage rate, the better your credit score will be. Why is this important? Not only will you be saving on interest, but credit score companies love seeing responsible behavior and this will increase your score. Side note: If you are paying your cards off in full then the APR on your card really doesn’t matter. However, I still encourage you to look for the lowest APR possible to save on interest in the event you do have to keep a balance. Up until this point I’ve talked exclusively about credit cards, however it’s important to have other types of debt as well (such as an auto or student loan) Even if you could pay for a car in full, I encourage you to take out a loan. You can pay it down extra-quickly (or even in full!) but the fact that you took it out will still help increase your credit score. Why is this important? Credit score companies like seeing that you’ve been responsible with more than one type of debt. This seems counterintuitive but closing credit card accounts can actually hurt your credit score. In addition, if you don’t use your credit card regularly (I encourage clients to use theirs at least every 6 months) the company may close your account. Why is this important? Because as mentioned before, the amount of debt you actually have used versus what the company has extended to you is a major player in your credit score. Alright, that’s all I’ve got! Any tips to increasing your credit score that I may be missing? If so, drop them in the comments below (or share what you’ve learned about building a credit score too!). Cheers to increasing your credit! P.P.S. - Next blog post on paying down your debt. Sign up above so you don’t miss out! I’ve always been a sucker for thrift shopping. I guess you could say it runs in my family. We had this huge gift exchange for Christmas back in those days. “Santa” (aka our uncle’s neighbor) would ride the snowmobile across the lake with a huge sack full of gifts. My grandma had a LOT of grandchildren (19ish at that point) and would give us the funniest gifts, many of them from garage sales. I remembered growing up checking out garage sales with my mom and grandma, and still have a hard time resisting a browse through when one happening in the neighborhood. I’ve never been too good for thrift shopping, and actually find it quite enjoyable. The whole notion of “one person’s trash is another’s treasure” couldn’t be more true, and I love sorting through things and finding that cool gem someone decided wasn’t valuable to them any longer. I have bought numerous dresses I’ve worn to weddings (and gotten lots of compliments on! ), plenty of clothing, furniture/decorations, and even our barstools (for $1.97 total!) at thrift stores. Yesterday afternoon I had an epic thrift store roundup and wanted to share what I deem to be 5 tips to successfully shop thrift. I know there are lots of people who don’t shop thrift and who are intimidated by the thought of it. I’m hoping this list will give you a better idea of what to look for so you too can find some amazing deals of your own! 1) Look for brands that you are familiar with. If you’re completely new to thrifting, I suggest looking for brands that you already know and love (or at least recognize!) By doing so you will have a better idea of the sizing, fit and quality instead of buying something from a company/brand you’ve never heard of and are unsure of what to expect. I always look for higher end brands when I shop thrift (as you can typically find them for the same price as what would be less-expensive brands) and the quality is typically much better. 2) Stay away from items that already look worn out. This goes for all of shopping, but needs to be mentioned especially in the event of thrifting. There are going to be lots of good deals when thrifting, but if you buy just because you are getting it for cheap, you will end up with a lot of crap you don’t love and didn’t need in the first place. Same goes for if you’re buying because you think you’ll like/use the item OR because it was “the best you could find” at that time. I like to remind myself that if I don’t love it enough to have purchased it for full price, the cheaper price tag is not going to make me love it in the long run (even if it feels good to save initially!) My rule is I don’t buy something unless I truly LOVE it, not because it’s practical or cheap or the “best” option. 4) Take advantage of special sales. The Goodwill thrift stores have special sales coordinated with the days of the week. For example, Thursday is kids day and you can get 50% off of children’s clothing, shoes, toys etc. I got my daughter’s snowsuit for $2 thanks to purchasing it on a Thursday and those bar stools I mentioned above on another sale day for less than $2. There are lots of other deals like this at thrift stores and I encourage you to take note and shop accordingly! Just because you didn’t find anything “good” during your first trip thrifting (or even the first few!) doesn’t mean it’s not worth it. There are plenty of times I go to browse and don’t find a single thing worth purchasing. But then there are other times where I find heaps of quality stuff that I truly love. Thrifting is a long term game and can be really fun and enjoyable if you don’t give up! My latest thrift store roundup! Before starting I had my doubts about a) whether the method actually worked and b) whether it would actually work for me. I can now say the answer is both yes…and no. You have to be willing to follow the steps (in order!) and they will definitely take some time and effort. That being said, the steps are easily laid out and the process is very simple. I can 100% see why this method works for so many. When I was first reading the book I was super excited and so ready to start de-cluttering our home. It seems that I can never keep our home clutter-free for long, and it drives me absolutely nuts. The dining room table seems to be a “catch-all” where we throw everything that doesn’t seem to have a place (or it does have a place, but we don’t put it there!) Can you relate?! 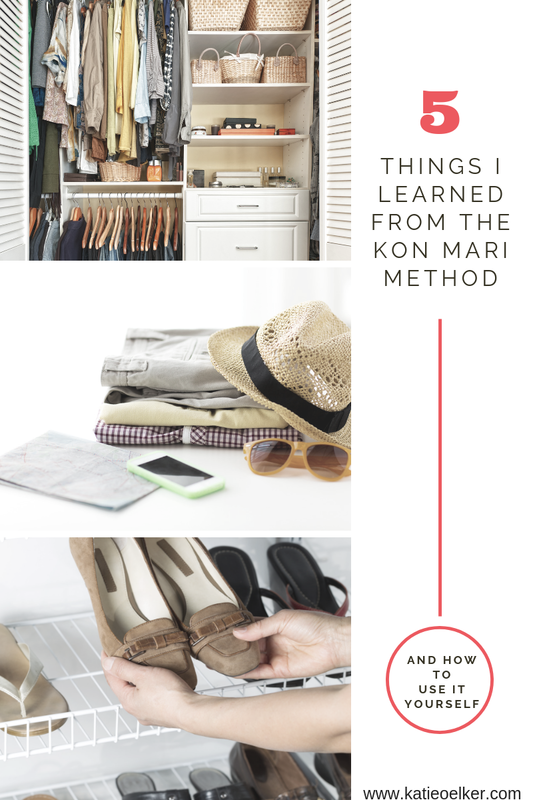 I dove right in, starting with clothes, shoes, and books like Marie recommends. I couldn’t believe how many articles of clothing and shoes I was keeping “just because”. There was stuff I hadn’t worn in years, stuff I was justifying keeping because I felt I should (even though I didn’t love it), and stuff that really didn’t suit my style or my lifestyle anymore. Books was an especially difficult category for me as I love my books and seem to have an emotional attachment to them. I was, however, able to donate all books that did not “spark joy”. After these few categories though, I started to lose momentum. My energy for organizing was dwindling. I knew there were a lot of categories I’d have to have my husband sign off on the donating/throwing and it delayed my efforts. If you try out the KonMari method yourself, I suggest creating a calendar of when you will attack which categories and then check off your progress as you go along. When I re-start the process again, I will definitely be doing these things to keep me accountable! The biggest issue I had was how to de-clutter things for my child. I cannot ask her “does this spark joy?” yet as she is only 16 months old and obviously cannot answer that. I know that having too many toys can be a stressor for children, and I definitely don’t want her to grow up feeling overwhelmed with “stuff”. Also - the fact that we have very little storage and are expecting another child means that we cannot give away certain items that we are going to use again. Which means that the office/guest bedroom has a bassinet, baby swing, baby gates, baby bouncer among other baby items in there. Yikes! If you have children and are practicing the KonMari method I recommend giving yourself lots of grace along the way! Do you struggle with this too?! You see something on sale and then start trying to determine where it would fit into your wardrobe or home, justifying that you need it just because it’s on sale. Practicing this method has made me more aware of what I truly NEED vs what I want to buy because it’s a “good deal”, and hopefully it does for you as well. 5) Guilt for having bought things and then not using them is a real struggle! This guilt delays my efforts to get rid of items I know longer love/use. I think about the money I spent on them and feel so guilty I try talking myself out of getting rid of them! However that money has already been spent, and the negative energy of holding on to the particular item and causing more clutter is outweighing the benefits of keeping it “just because”. If you struggle with this too just think of how someone else will benefit from you donating this item, and send it on its way! Alright, that’s what I’ve got so far for my experiment with the Kon Mari Method. If you’ve tried this method before and have any insights, I’d love to hear them in the comments below! Let’s be honest, in today’s society we are all seeking more abundance, bigger bank accounts and more freedom. Am I right? But here’s the catch: at what expense are we striving for these things? That being said, in my adult years and having met and worked with people of all levels of wealth, I’ve come to this realization: rich people are just people with more money. Rich people are not immune to any of the heartbreaks and heartaches that people without as much money experience. My mom is an amazing seamstress and has some very wealthy (read: multi-millionaire) clients whom have become dear friends. She also has some friends who live in very wealthy areas (again, we are talking millionaires). Some of these people have committed suicide. Some have gotten divorced. Some never had children and regret the choice now that they are in their 50s and 60s. One wealthy couple she knew even became a suicide-homicide case because the woman had filed for divorce (or so they concluded). I'm not telling you these things to paint a gruesome picture of wealth or to mess with your money mindset. It's not money’s fault that these people were unhappy and I do NOT believe that more money equals more problems. BUT more money does not protect wealthy people from problems. It does not sugarcoat life against depression, anxiety, anger, stress, fear, regret or other undesirable emotions. It’s true. The majority of lottery winners end of getting divorced or ending up right back where they were financially (or worse!) You even hear stories of professional athletes or actors/actresses who had to file bankruptcy. So do you stop pursuing your dream of making lots of money and becoming “rich" one day? Of course not. 1) Continue to pursue your dreams and big wealth (or little wealth - whatever you are after!) but take care of yourself and your loved ones along the way. 3) View money as neutral. Of course it can add joy, flexibility, choices, and freedom but money itself is just paper (or plastic or metal!) and is neutral. Money used for good is good. Money used for bad is bad. Take money off a pedestal before it clouds your judgement and taints your happiness. 4) Make sure the money you spend is in alignment with your values, priorities, and goals. A lot of times it has less to do with how much money you make, and more to do with how you use your money. If you are stuck buying material goods instead of experiences or blowing money on things that aren’t adding to your happiness, it’s time to re-evaluate. Does this make sense? If so, let me know in the comments below. I know this post was a bit of a darker subject but it is one that I felt needed some attention. I see a lot of individuals who dread going back to work post-baby, or wish to stay home after another child is added to the mix and it honestly kind of breaks my heart. 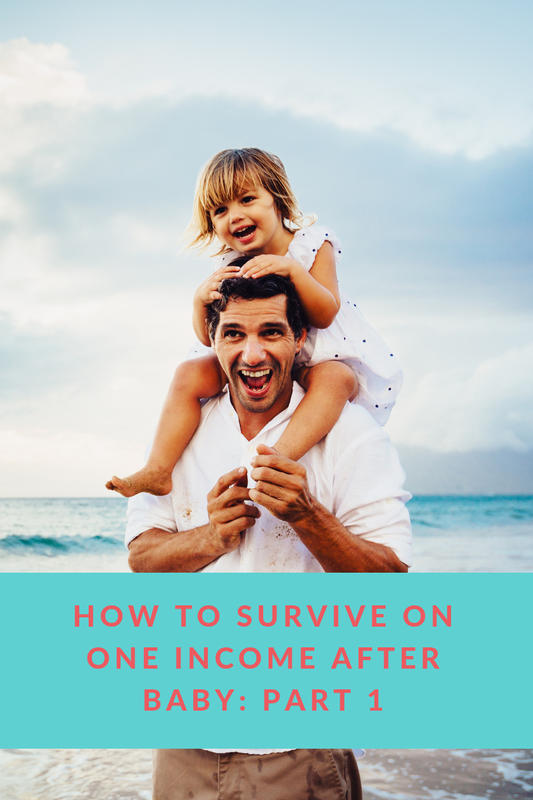 Now while I know this isn’t feasible for everyone nor does everyone desire to stay at home part- or full-time with their child(ren), today I wanted to share my story of how we are surviving on one income post-baby, and how you might be able to as well. You see, I never expected to up and quit my job after having a kid. I have always worked and genuinely love working. Working gives me purpose. Even as a teacher and having the summers “off” (if you will..teachers know that’s not entirely true!) I would always get a bit of the summer blues without having a set purpose each day. Sounds strange for those of you who loathe your jobs and hate working, but I know I’m not the only one. So while I quit teaching to go into financial services over 3 years ago now, I didn’t expect to leave the industry after the birth of our first child. I’ll be the first to admit that leaving a steady-paying teaching job to take on a commission-only role is scary.as.hell. Those 2.5 years in the industry were definitely more of a challenge than when both my hubby and I had stable jobs, but I wouldn’t take it back. It opened my eyes to the world of entrepreneurship, helped me begin this career as a financial coach, and has helped shape me into who I am today. I know everyone is different and has different viewpoints on childcare and I am definitely not here to change your mind one way or the other. So I know this might be unreasonable for some people, but this has really helped us. We bought the home we currently live in over 4 years ago when I was still teaching. We absolutely love this home, but now adding a dog and a baby it has become quite cramped! However, we refused to upgrade until we knew a little bit more about how our financial situation was going to play out post baby. If you think you may want to stay home with baby part- or full-time, I recommend not making any major moves until after baby has arrived and you can evaluate your financial situation. My husband and I love to travel and since dating have always taken an international trip once/year (at least!) We would go for 1.5-2 weeks and thoroughly enjoy ourselves. Although yes we both love traveling and exploring other countries and cultures, this is just something that is not in the cards for us on one main income and we are OK with that. We know we will return to internationally traveling (likely with the kiddos!) in the future and are happy with our long-weekend trips when we can sneak them in. I highly suggest people understand what is coming in and what is going out every month. We use Mint to categorize our spending and track budgets, and I cannot recommend it highly enough. It helps me understand where we’ve overspent, what we can cut back on, and how we’re doing financially at any given moment in time. For us, it’s menu planning and grocery shopping on the weekends. If we don’t have a solid game plan going into the week, it is FAR too easy to grab take out or go out to eat after a long day. If you know you’re going to three weddings in the Fall (that’s us! ), have a vet appointment coming up, or are paying your bi-annual insurance premiums, mark it down so you have an idea of what will be spent so you’re not caught blindsided with the expense when the time comes. Try adding a savings category for “unexpected” expenses (not emergency fund, that’s different) as I’ve found that unexpected things tend to happen every month! 6) Adopt “short term pain for long term gain” as your mantra. Sure you many not be able to take all the vacations, buy all the things that you used to be able to, or save as much for retirement as you’d like currently. BUT the satisfaction of being able to be home full- or part-time with your kiddo if you desire will be totally worth it. Alright, that’s a wrap! For those of you already at home part- or full-time, anything you have to add? For those of you who aren’t but would like to, what questions do you have? Let me know in the comments below. There are so many money “gurus” out there giving you advice to save more and spend less. Clipping coupons, shopping at discount stores, automating your savings, and sticking to a strict budget are a few that come to mind. But despite all of these things, I found that there was something missing in my quest to save more. Something unconventional; something that no one is talking about. 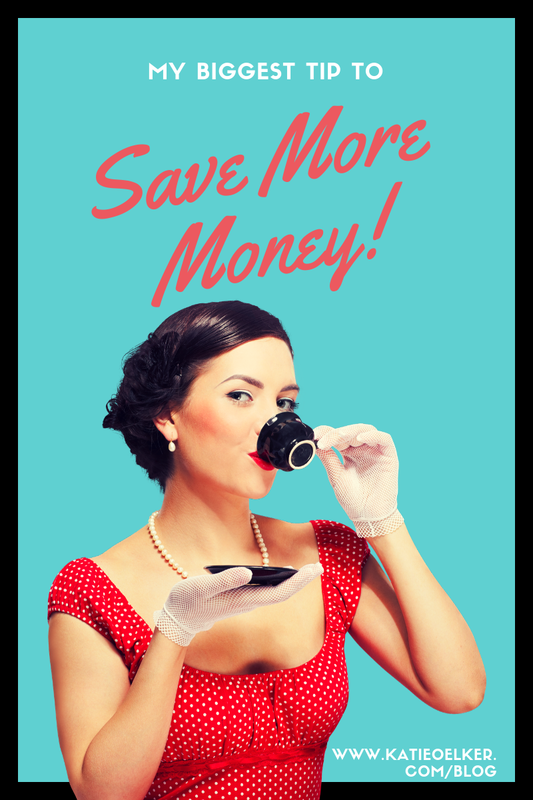 So what’s my biggest trick to saving more money? Not giving a $hit about what other people think. Yep, you read that right. By not giving a $hit about what other people (or society!) think, you can save yourself a whole ton of money. How many spending decisions do you make based on what other people (or society!) have have made you feel is cool? Trendy? Necessary? Getting your hair/nails done, buying new outfits, upgrading your home, saying “yes” to that dinner invite. All of these things cost money. And all of these are usually impacted by how we want others to view us. A few weeks ago my husband and I were headed to a wedding. Usually for weddings I get my nails done and was about to do the same for this one. Lots of us are walking around buying into a certain ideal that we feel we need to be living up to (hello keeping up with the Joneses), and it’s costing us. Always having the newest gadgets, clothing, shoes, homes, cars, whatever (the list is seriously endless!) is darn right expensive. 1) Am I doing this for me or am I doing this because I care about what other people think of me? 2) If I truly am doing this for me, is it for a version of myself that I feel I have to be because of society/others? 3) Is whatever I am buying just a facade? 4) Is this purchase going to make me happier in the long run? Tell me in the comments: Does this make sense? What have you purchased recently because you felt you had to live up to other’s/society’s standards? How will you use this tactic in the future? Yep, that's right, it's that easy. This morning I asked my husband if he still uses Audible and Evernote (that we are paying for) and his response? "No" to Audible and "we are paying for that?" to Evernote. My hubby doesn't check the bank statements/accounts ever (thank goodness he has a wifey that does! ), so how would he have any idea about these things? How many of you are paying for subscriptions that don't make your life happier or easier? How many of you are paying for subscriptions you *gasp* no longer use? How many of you have no idea what actually comes out of your bank account (what I like to call ostrich syndrome)? No judgement here, we are all guilty of this at one point or another. Automation and technology have made it so easy to sign up and subscribe without realizing how much we are actually paying for various things each month. Have you had a recent *aha* when it comes to what you've been paying for without realizing it? If so, leave me a comment and let me know. I would love to hear about it! And if you aren't sure, here's your friendly reminder to glance at those statements and figure it out. Let's wake up to what we are actually spending our hard earned money on, so we can buy more of what we REALLY want.